Do you have your's yet? If not, check these out from USA Emergency Supply. While I wouldn't want to have to eat these for weeks on end, I'd be grateful to have them if we had to "get out of Dodge" in a hurry and food was scarce! Because a GOODY bag is meant to be portable, you really can't pack a bunch of food supplies for being on the go. Even if you could, how would you preserve it or prepare it? 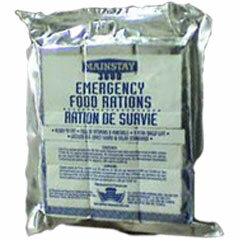 Emergency Ration Bars need no preparation, have a long shelf life, and take up little space for the amount of nutrients, vitamins, minerals, and calories you get per bar, making them ideal for a portable 72-Hour kit. And it wouldn't hurt to have some extras stashed at the office, in a car, a dorm room, or other location away from home. 1. Visit their site and review this item by reading the product description and then come back here and leave a comment sharing what you learned about this product that was appealing to you or something new you learned. You can also share how you would utilize these Bars. Please leave an email address if you do not have a blog so I can contact you if you are the winner. 2. Enter a second time by blogging, tweeting, or facebook this give away. You must link back to Homestead Revival™ and then leave a second separate comment telling me which of the three social network things you did. This give-away ends Saturday, May 21 at 5:00 p.m. PST.